Towering 4,000 meters high, the triple peak crest of Eiger, Mönch, and Jungfrau form what’s commonly known as the Jungfrau Region. If you only have time to visit one region in Switzerland, this is arguably one of the best spots to land. As you begin planning your adventure to the Swiss Alps, you might find it a bit overwhelming. This region is home to a number of villages, popular excursions and famous landmarks – many of which have similar names. For example, Jungfrau is the region we are about to uncover, whereas Jungfraujoch is a platform high in the alps famed for its title “Top of Europe”. Fortunately, these villages are so close together there will be no need to choose only one to visit. However, you will be asking yourself which one you should visit first! Let’s explore four of the most beautiful villages in the Jungfrau Region and some itinerary-worthy adventures. The charming village of Grindelwald is perched at the bottom of the dramatic Mount Eiger. Breathtaking scenery engulfs your view upon every step. As a matter of fact, the charming Swiss chalets, pops of bright florals, and grazing alpine cows are some of my favorite scenic memories. Grindelwald, and the entire Jungfrau Region, offer an abundance of outdoor activities. Grindelwald First is a summit known for some of Switzerland’s best hiking trails. It can be reached by cable car in the village. If you are looking for an easy day of hiking, venture to Bachalpsee Lake – don’t forget to pack a picnic! This is the perfect spot to lay down a blanket while enjoying the water’s alpine reflection. After lunch, you might be craving a more strenuous hike. If so, keep trekking up the mountain to Faulhorn. Of course, the view is worth every step and breath lost! Here, there is a restaurant and lodge where you can order a well-deserved beverage. Another popular hike from Grindelwald First is Grosse Scheidegg. This is where the rocky terrain opens to a wildflower haven atop the mountain. When your feet need a break, Grindelwald has other types of activities to keep your days full. From Grindelwald First, you have a variety of heart-racing options down the mountainside. Race in a mountain cart, trottibike or fly down via cableway. Stay on top of the mountain’s ledge and walk the dramatic Cliff Walk. This charming village in the Jungfrau Region will keep you busy for days! Depending on when you are traveling to the Jungfrau Region, Murren could be the perfect spot to escape tourist crowds. For this reason, it is often considered the perfect home base. To get to this car-free village it takes a 20-minute cable car ride over the mountainside. In fact, you’ll be happy to know that views, views, and more views are what this hideaway is all about. An easy addition to your Murren itinerary is a visit to Schilthorn. Made popular by its appearance in the James Bond films, the Piz Gloria is a spectacular rotating restaurant placed atop this summit. After you’ve ventured upwards, make sure to take some time to uncover the beauty of Murren. No matter what season, the surrounding trails offer anything from snowy tobogganing to walking paths. Finally, you can’t leave this village without a dinner stop at Hotel Eiger. Make sure to order the fondue. This secluded alpine paradise is definitely a spot you’ll want to add to your Jungfrau Region itinerary. 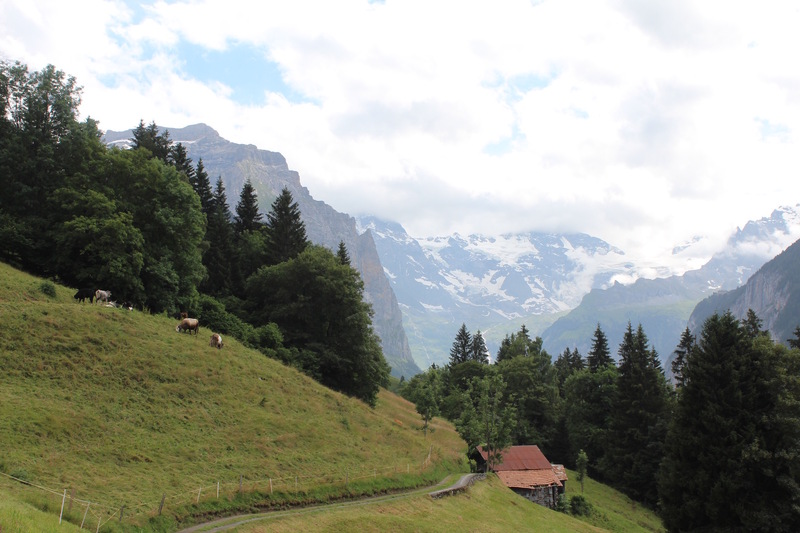 This village is easily the most scenic in all of the Jungfrau Region. In my opinion, it is one of the most beautiful in the world! Not to mention, it is the perfect concoction of jagged mountainsides, towering waterfalls, and charming Swiss chalets. The striking image of the Staubbach waterfall plunging through the backdrop of the town, is the perfect representation of Lauterbrunnen. Coming from a name meaning “many fountains”, it comes as no surprise that this area is home to 72 flourishing waterfalls. It is also why many of Lauterbrunnen’s excursions revolve around waterfalls. Trümmelbach Falls is the first must-see on the waterfall list. What makes the falls so dramatic is that they live within the mountain itself. Twisting, spiraling, and plummeting through the cave walls. These waters have shaped the gorge for centuries. They are also the only underground glacier waterfalls on the planet that are accessible by tunnel lift. Hiking this village is another easy way to uncover some of the picturesque waterfalls. In this part of the Jungfrau Region, the landscape alone always renders me speechless. Wengen is another car-free oasis, halfway up Mount Eiger. 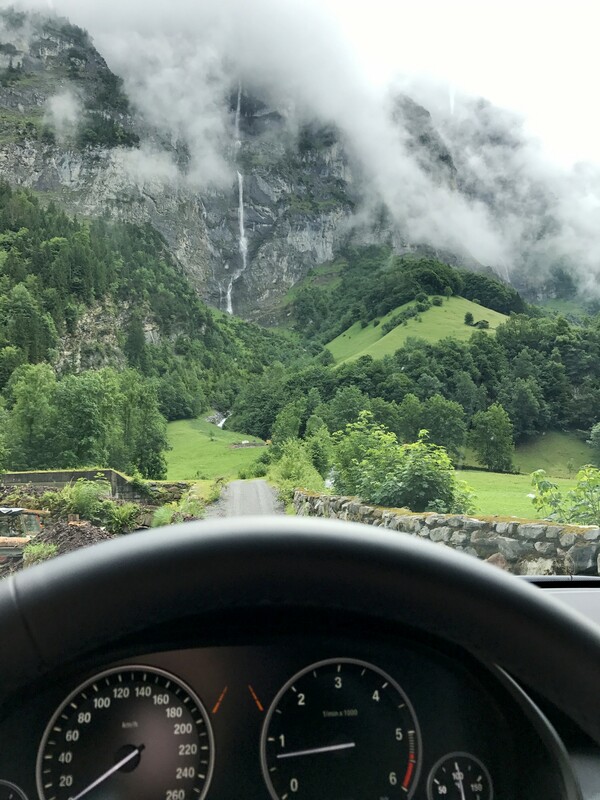 Leave your car behind in Lauterbrunnen as you climb upwards in a Wengernalp railway cart. This village is the perfect base for some additional epic hiking trails. First, you’ll want to hike from Mannlichen to Kleine Scheidegg. Be camera-ready for some incredible panoramas over the entire Jungfrau Region. Afterwards, explore the village of Wengen. Follow your sense of smell to find some of the best raclette, one of my favorite Swiss meals! You could even make a pit-stop for a quick game of mini golf or sample some delicious Swiss raclette. The most charming part about this village is its remoteness. There is nothing better than that feeling of peace and utter privacy in your own alpine hideout. This is the magic of the Jungfrau Region. Jungfraujoch: As I mentioned above, this is a dramatic mountain top platform coined with the name “Top of Europe”. Accessible from every village via railroad, this is a must-do. I would recommend waking up early and securing the first time slots of the day. This will not only help you escape the crowds, but the view of watching the sunrise over the mountains is jaw-dropping. Once you arrive, you’ll find a tiny village equipped with a hotel, various restaurants, and an underground passage leading to an Ice Palace. If you can, wait to book this activity until you have a good idea what the weather will be like. It is best to make sure that when you make it to the “Top of Europe” you can see past your hand! Ballenberg Open Air Museum: If you are traveling from April to October, venture on over to this open air museum. Original Swiss houses, farms, and regional architecture are on display throughout the crisp mountain air. The museum aims to demonstrate a traditional Swiss lifestyle with activities like weaving, gardening, and more. The Beatus Caves: These caves are located on the Eastern shores of Lake Thun, just outside the town of Interlaken. Intricate gorges, waterfalls, and limestone caves draw you in and will have you “oohing and aahing”. These caves are also seasonal, so make sure you travel between late March to early November. Looking for more destinations across Switzerland? Check out 10 of Switzerland’s best places to visit. I’m definitely putting all four villages on my bucket list. Thank you for sharing! I’m so glad I found this page. Gracias!